—Diseases of individual bursæ in the upper and lower extremities. A bursa is a closed sac lined by endothelium and containing synovia. Some are normally present—for instance, that between the skin and the patella, and that between the aponeurosis of the gluteus maximus and the great trochanter. 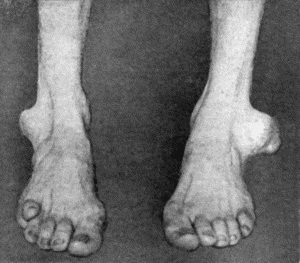 Adventitious bursæ are developed as a result of abnormal pressure—for example, over the tarsal bones in cases of club-foot. Injuries of Bursæ.—As a result of contusion, especially in bleeders, hæmorrhage may occur into the cavity of a bursa and give rise to a bursal hæmatoma. Such a hæmatoma may mask a fracture of the bone beneath—for example, fracture of the olecranon. Diseases of Bursæ.—The lining membrane of bursæ resembles that of joints and tendon sheaths, and is liable to the same forms of disease. Infective bursitis frequently follows abrasions, scratches, and wounds of the skin over the prepatellar or olecranon bursa, and in neglected cases the infection transgresses the wall of the bursa and gives rise to a spreading cellulitis. Traumatic or Trade Bursitis.—This term may be conveniently applied to those affections of bursæ which result from repeated slight traumatism incident to particular occupations. The most familiar examples of these are the enlargement of the prepatellar bursa met with in housemaids—the “housemaid's knee” (Fig. 113); the enlargement of the olecranon bursa—“miner's elbow”; and of the ischial bursa—“weaver's” or “tailor's bottom” (Fig. 116). These affections are characterised by an effusion of fluid into the sac of the bursa with thickening of its lining membrane. While friction and pressure are the most evident factors in their production, it is probable that there is also some toxic agent concerned, otherwise these affections would be much more common than they are. Of the countless housemaids in whom the prepatellar bursa is subjected to friction and pressure, only a small proportion become the subjects of housemaid's knee. Clinical Features.—As these are best illustrated in the different varieties of prepatellar bursitis, it is convenient to take this as the type. In a number of cases the inflammation is acute and the patient is unable to use the limb; the part is hot, swollen, and tender, and fluctuation can be detected in the bursa. In the majority the condition is chronic, and the chief feature is the gradual accumulation of fluid constituting the bursal hydrops or hygroma. When the affection has lasted some time, or has frequently relapsed, the wall of the bursa becomes thickened by fibrous tissue, which may be deposited irregularly, so that septa, bands, or fringes are formed, not unlike those met with in arthritis deformans. These fringes may be detached and form loose bodies like those met with in joints; less frequently there are fibrinous bodies of the melon-seed type, sometimes moulded into circular discs like wafers. The presence of irregular thickenings of the wall, or of loose bodies, may be recognised on palpation, especially in superficial bursæ, if the sac is not tensely filled with fluid. The thickening of the wall may take place in a uniform and concentric fashion, resulting in the formation of a fibrous tumour—the solid bursal tumour—a small cavity remaining in the centre which serves to distinguish it from a new growth or neoplasm. Fig. 113.—Hydrops of Prepatellar Bursa in a housemaid. The treatment varies according to the variety and stage of the affection. In recent cases the symptoms subside under rest and the application of fomentations. Hydrops may be got rid of by blistering, by tapping, or by incision and drainage. When the wall is thickened, the most satisfactory treatment is to excise the bursa; the overlying skin being reflected in the shape of a horse-shoe flap or being removed along with the bursa. Other Diseases of Bursæ are associated with gonorrhœal infection, and with rheumatism, especially that following scarlet fever, and are apt to be persistent or to relapse after apparent cure. 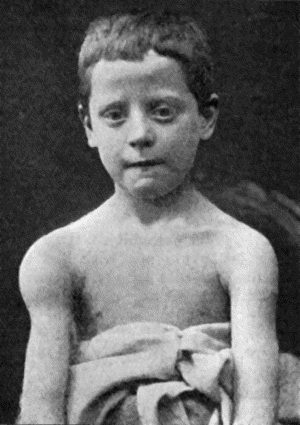 In the gouty form, urate of soda is deposited in the wall of the bursa, and may result in the formation of chalky tumours, sometimes of considerable size (Fig. 114). Tuberculous disease of bursæ closely resembles that of tendon sheaths. It may occur as an independent affection, or may be associated with disease in an adjacent bone or joint. It is met with chiefly in the prepatellar and subdeltoid bursæ, or in one of the bursæ over the great trochanter. The clinical features are those of an indolent hydrops, with or without melon-seed bodies, or of uniform thickening of the wall of the bursa; the tuberculous granulation tissue may break down into a cold abscess, and give rise to sinuses. The best treatment is to excise the affected bursa, or, when this is impracticable, to lay it freely open, remove the tuberculous tissue with the sharp spoon or knife, and treat the cavity by the open method. Syphilitic disease is rarely recognised except in the form of bursal and peri-bursal gummata in front of the knee-joint. Fig. 115.—Tuberculous Disease of Sub-deltoid Bursa. The sub-deltoid or sub-acromial bursa, which usually presents a single cavity and does not normally communicate with the shoulder-joint, is indispensable in abduction and rotation of the humerus. When the arm is abducted, the fixed lower part or floor of the bursa is carried under the acromion, and the upper part or roof is rolled up in the same direction, hence tenderness over the inflamed bursa may disappear when the arm is abducted (Dawbarn's sign). It is liable to traumatic affections from a fall on the shoulder, pressure, or over-use of the limb. Pain, located commonly at the insertion of the deltoid, is a constant symptom and is especially annoying at night, the patient being unable to get into a comfortable position. Tenderness may be elicited over the anatomical limits of the bursa, and is usually most marked over the great tuberosity, just external to the inter-tubercular (bicipital) groove. When adhesions are present, abduction beyond 10 degrees is impossible. Demonstrable effusion is not uncommon, but is disguised by the overlying tissues. If left to himself, the patient tends to maintain the limb in the “sling position,” and resists movements in the direction of abduction and rotation. In the treatment of this affection the arm should be maintained at a right angle to the body, the arm being rotated medially (Codman). When pain does not prevent it, movements of the arm and massage are persevered with. In neglected cases, when adhesions have formed and the shoulder is fixed, it may be necessary to break down the adhesions under an anæsthetic. The bursa is also liable to infective conditions, such as acute rheumatism, gonorrhœa, suppuration, or tubercle. In tuberculous disease a large fluctuating swelling may form and acquire the characters of a cold abscess (Fig. 115). The bursa underneath the tendon of the subscapularis muscle when inflamed causes alteration in the attitude of the shoulder and impairment of its movements. An adventitious bursa forms over the acromion process in porters and others who carry weights on the shoulder, and may be the seat of traumatic bursitis. The bursa under the tendon of insertion of the biceps, when the seat of disease, is attended with pain and swelling about a finger's breadth below the bend of the elbow; there is pain and difficulty in effecting the combined movement of flexion and supination, slight limitation of extension, and restriction of pronation. In the lower extremity, a large number of normal and adventitious bursæ are met with and may be the seat of bursitis. 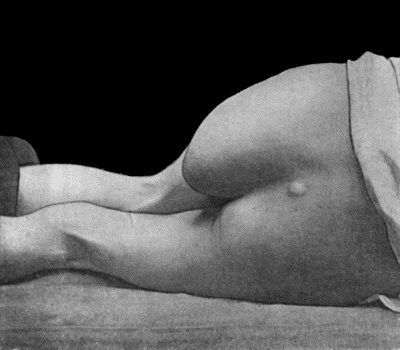 That over the tuberosity of the ischium, when enlarged as a trade disease, is known as “weaver's” or “tailor's bottom.” It may form a fluctuating swelling of great size, projecting on the buttock and extending down the thigh, and causing great inconvenience in sitting (Fig. 116). It sometimes contains a number of loose bodies. There are two bursæ over the great trochanter, one superficial to, the other beneath the aponeurosis of the gluteus maximus; the latter is not infrequently infected by tuberculous disease that has spread from the trochanter. The bursa between the psoas muscle and the capsule of the hip-joint may be the seat of tuberculous disease, and give rise to clinical features not unlike those of disease of the hip-joint. 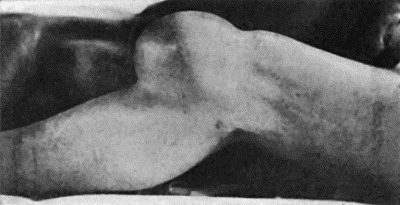 The limb is flexed, abducted and rotated out; there is a swelling in the upper part of Scarpa's triangle, but the movements are not restricted in directions which do not entail putting the ilio-psoas muscle on the stretch. Cartilaginous and partly ossified loose bodies may accumulate in the ilio-psoas bursa and distend it, both in a downward direction towards the hip-joint, with which it communicates, and upwards, projecting towards the abdomen. The bursa beneath the quadriceps extensor—subcrural bursa—usually communicates with the knee-joint and shares in its diseases. When shut off from the joint it may suffer independently, and when distended with fluid forms a horse-shoe swelling above the patella. In front of the patella and its ligament is the prepatellar bursa, which may have one, two, or three compartments, usually communicating with one another. It is the seat of the affection known as “housemaid's knee,” which is very common and is sometimes bilateral, and, less frequently, of tuberculous disease which usually originates in the patella. Fig. 116.—Great Enlargement of the Ischial Bursa. The bursa between the ligamentum patellæ and the tibia is rarely the seat of disease. When it is, there is pain and tenderness referred to the ligament, the patient is unable to extend the limb completely, the tuberosity of the tibia is apparently enlarged, and there is a fluctuating swelling on either side of the ligament, most marked in the extended position of the limb. Of the numerous bursæ in the popliteal space, that between the semi-membranosus and the medial head of the gastrocnemius is most frequently the seat of disease, which is usually of the nature of a simple hydrops, forming a fluctuating egg-or sausage-shaped swelling at the medial side of the popliteal space. It is flaccid in the flexed, and tense in the extended position. As a rule it causes little inconvenience, and may be left alone. Otherwise it should be dissected out, and if, as is frequently the case, there is a communication with the knee-joint, this should be closed with sutures. An adventitious bursa may form over the lateral malleolus, especially in tailors, giving rise to the condition known as “tailor's ankle” (Fig. 117). The bursa between the tendo-calcaneus (Achillis) and the upper part of the calcaneus may become inflamed—especially as a result of post-scarlatinal rheumatism or gonorrhœa. The affection is known as Achillo-bursitis. There is severe pain in the region of the insertion of the tendo-calcaneus, the movements at the ankle-joint are restricted, and the patient may be unable to walk. There is a tender swelling on either side of the tendon. When, in spite of palliative treatment, the affection persists or relapses, it is best to excise the bursa. The tendo-calcaneus is detached from the calcaneus, the bursa dissected out, and the tendon replaced. If there is a bony projection from the calcaneus, it should be shaved off with the chisel. The bursa that is sometimes met with on the under aspect of the calcaneus—the subcalcanean bursa—when inflamed, gives rise to pain and tenderness in the sole of the foot. This affection may be associated with a spinous projection from the bone, which is capable of being recognised in a skiagram. The soft parts of the heel are turned forwards as a flap, the bursa is dissected out, and the projection of bone, if present, is removed. The enlargement of adventitious bursæ over the head of the first metatarsal in hallux valgus; over the tarsus, metatarsus, and digits in the different forms of club-foot; over the angular projection in Pott's disease of the spine; over the end of the bone in amputation stumps, and over hard tumours such as chondroma and osteoma, are described elsewhere.